My kids don't usually write up long or detailed wish lists for Santa. However, this year all three of them requested an iPod Touch for Christmas (after seeing several friends and cousins with them recently). Like most of us, though, Santa is on a budget this year. Even one iPod would be stretching it, so three iPods would be out of the question. Luckily, Santa's elves had a very clever solution that I think will be the next best thing to an actual iPod under the tree. The elves shared with me what they did in their workshop and I really like the way they turned out. and all the people and employees have left? That's how the elves picked up these frames on sale at JoAnn's! 2. 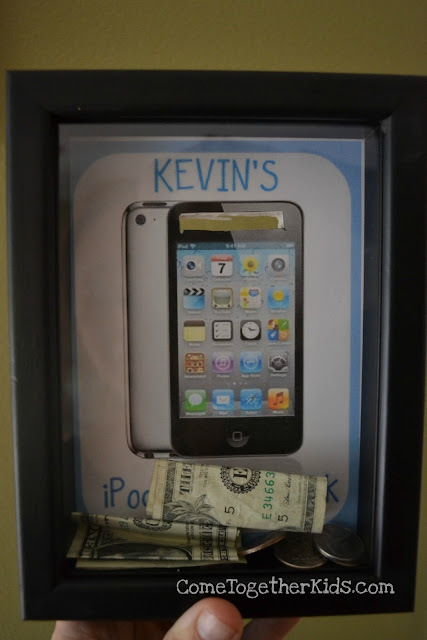 Cut out your picture to fit your shadowbox and cut a small opening for the money. 3. Line up your picture with the backing for the shadowbox (these were made out of foam board) and then cut a money slot in that as well. 4. 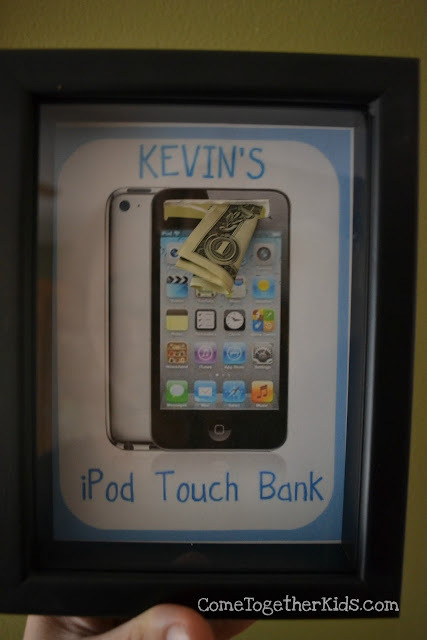 The elves thought these banks might be able to used to save for other special items in the future, so they just put a little bit of glue around the money slot to adhere the picture to the backing. This way, once they've saved for their iPods, the kids can simply replace the picture and start saving for something else. 5. That's it! 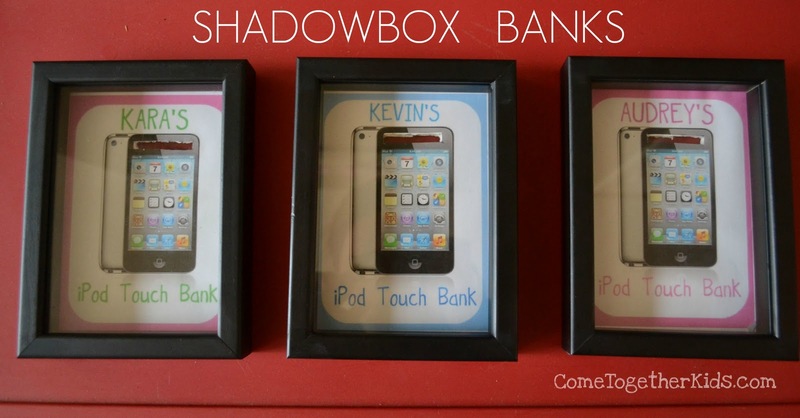 Put it all together and your shadowbox bank is ready to go! ... and with each deposit, you're one step closer to buying that something special! Santa's elves told me that each frame was only $4 on sale and Santa said he would probably put $10 in change and bills in each bank to start the kids on their way. Santa's accountants were very happy that he was spending $42 instead of $600+ and I think the kids will learn a valuable lesson about saving for the things they want most! Love this idea. My guys is only 4 but I am going to store idea for the future!! I love this smart idea and also like to read beautiful content of this blog. It’s really amazing. Thanks for sharing here steps of making shadowbox banks which would like to share with some of my students who needs such kind of shadowbox banks and are usually come to seek help on how to structure Quality help with finance assignment UK properly and how to use the correct format form me at our consultancy Quality Assignment UK where I am currently working as an academic writer and providing excellent help for writing assignment on different subject such as marketing, business, finance, nursing, human resource to UK students at best price. I am also sharing this awesome idea to more people at our consultancy. Keep sharing. I love this!! My niece has talked about saving up for a dSLR camera, and I already decided I was going to give her some money to help get her started. This will be great!! I love the idea but aren't you a little concerned about their reaction on Christmas morning? It's great parenting to make them save up their money for something they want, but my concern would be when they open it, see the picture of the iPod and then the realization that it's not what they expected. I want my children to be responsible with money and to be realistic about expectations for Christmas (there's no way we could afford 3 either! ), but at the same time I want them to have positive experiences on Christmas. It teaches kids to appreciate what they do get for Christmas. That's the problem. We've lost sight anout what Christmas is actually about. It's not about the presents and if kids can't appreciate the things the things they do have/get do they really deserve anything at all? Very clever idea! Love it! Very cute idea! Defintely doing this the next time something "big" is on the wish list! Dj, I thought about that. However, I'm pretty sure they realize that it's very unlikely that they'll actually be getting an iPod on Christmas. They know that Santa only has a certain amount to spend and they've been saving some money in little containers already. I figure these banks will just be giving them a specific spot to save in. Plus, if they get any $ for Christmas from relatives, it can go right in their new bank if they choose. I love this idea! I'll definitely be making it for my girls! This is a great idea!!! Thanks for sharing, visiting from Get Your Brag On! Rubber cement would be a great idea to use in order to secure the backing since you can easily peal apart the paper and backing and then just rub away all the remaining rubber residue. 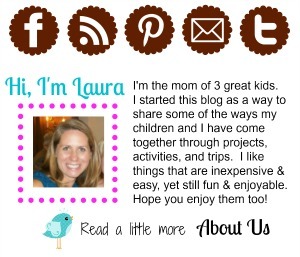 Love this idea, Laura. This would even be fun for a rainy day or vacation fund. Did Santa's favorite elf score 80% off at Michael's this past Sunday? My checking account cried the next day. Do you think coins would break the glass? I'm interested in doing this for our "Tahiti Fund" with a gorgeous picture of the beach in the back...but most of what we put in is spare coins and I'm afraid it would break the front. You could always swap out the glass with plexi. this is an awesome idea! My sister said "I need to do this with a vacation picture." 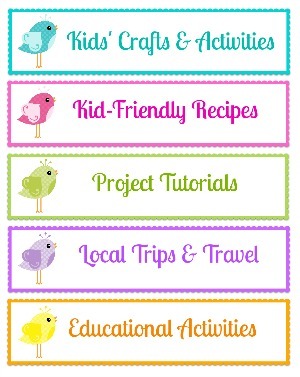 :) Such a great way to teach saving for something you want! 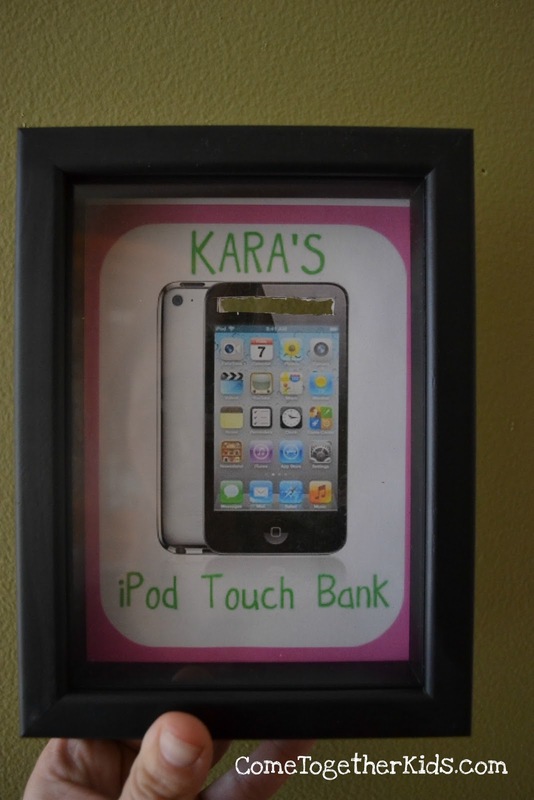 I'm making one of these for my little sister (16th birthday - car fund!). I was just wondering if your frame only had the foam back, or if there was also a thicker, more solid one? On my frame, there is a thick, wood-like back that the foam is attached to (all of the hooks and metal clasps to lock the frame are on the thick back). Just wanted to know your thoughts on what to do with it? Maybe leave it off, cut through the foam, and give the thicker back to her with the gift in case she wants to re-use it? Anyone else run into this? من مهدی پدرام مشاور سئو: SEO یا همان بهینه سازی برای موتورهای جستجو هستم. به زبان ساده یک سئوکار حرفه ای هستم که با هدف افزایش بازدید از گوگل یا هر کدام از موتورهای جستجویی می توانم به کسب و کار یا استارتاپ های شما مشاوره بدهم. بیشتر دوست دارم یک SEO Consultant باشم یا به عنوان یک مربی و یک راهبر پروژه ها و کمپین های افزایش بازدید ارگانیک از گوگل. The frames I bought only had the foam back and it's holding up fine. I would probably use just the foam on yours as well. If it's attached to the wood, you could just cut another piece of foam board to fit. love this idea!! im gonna do this for saving for my fiance and i's honeymoon!! I love the idea! My only fear is that for big things (trips and in my case a expensive camera lens) it is a lot of money to have in one place out of the bank. I love the idea! My only fear is that for big things. What we did was as it the bank filled up (especially with their folded up $1 bills), I had the kids count out their $$ and we deposited that in the real bank. It would be about $70 or so and they wrote the amount on a slip of paper that they put back in the shadowbox bank. It was helpful because they could see how much they'd saved so far, we didn't have too much cash in the house, and they earned a few pennies in interest once they deposited their savings to date. Definitely give it a try. My original intention was to put a hole in the top, but the shadowboxes I got had a metal frame and I'd need tools that I don't have to cut through it. I'm sure if you found wooden frames you could do it fairly easily! One of my Girl Scout suggested we do this as a troop to have the girls save for a trip to Savannah in 2 years. We will do lots of fund raising for the trip the girls will make theses at a meeting soon to start saving their spending money since the troop will not provide any extra for extras. Words Doctorate is providing PhD - Master Thesis, Dissertation and Research Paper related support for PhD Students-all stream. Gambling Online Have fun every day. Royal1688 Online game time slot game It is easy to access. Our online casino gaming service allows us to get into the betting system more quickly. We have a good chance. Betting activities It's fun to have fun. Standard life style It often makes us relax to be successful as well. Get excited with the atmosphere of modern betting. Every moment of fun people is online betting. It's fun to have fun at home. Do not tired With daily bets Every time a casino gamer on mobile, this time we are ready to change every opportunity for you to have a better alternative than the original without having to spend time traveling. Just open your mind to this world of online activities. Jika memungkinkan, sofa set murah bandung yang paling banyak dipilih adalah yang memiliki bentuk huruf U. Tetapi jika tidak memungkinkan, gunakan beli furniture murah bandung dengan bentuk L yang sesuai dengan luas ruangan yang tersedia. Dengan begitu, pengrajin kayu bandung yang tersedia semakin banyak tanpa membuat sofa tamu bandung terasa penuh dan sempit. Tapi, jika jual sofa tamu bandung lebih kecil dari yang Anda kira dan tidak memungkinkan untuk memasang kitchen set dengan bentuk jual hanaroo baby wrap di surabaya, maka Anda bisa memasang kitchen set pada satu sisi saja. Biasanya sambal roa halal ini memiliki dua bagian, yaitu jasa pembuatan furniture apartemen. Looking for JSC examination results for the year 2018?? Then this will be the right place for you. Get the entire information on jsc result 2018 here such as publish date, where and how to check the results etc. می شود گفت که روش های درمان بواسیر در کمترین زمان کم نیستند مزایای درمان بواسیر با لیزر در مقایسه با سایر روش های درمان بواسیر زیاد است، این مزایا در آسانی این روش، انجام در وقت کم و استفاده نکردن از مواد بیهوشی سایر روشها، استفاده از لیزر برای برش خلاصه می شود.علت بواسیر چیست؟ بواسیر یا همان هموروئید در پایین ترین ناحیه راست روده و انسداد رگ ها ظاهر شده و باعث متورم شدن آن ناحیه می شود.راه های یافتن بهترین دکتر بواسیر, پزشک بواسیر, متخصص بواسیر یا هموروئید با رشد روزافزون فضای مجازی کاری سخت نیست. شما می توانید به بهترین مرکز درمان بواسیر مراجعه کنید.درمان شقاق با لیزر در حالت کلی عوارض جانبی ندارد ولی در مواردی نادر می تواند باعث توسعه فیستول، ​عفونت، بی‌ اختیاری کنترل مدفوع، خونریزی ​دو هفته ای باشد. It looks really cool, I'm glad you shared this information with us. It looks exciting. Book International tickets Online from Puspack. Building niche blog commentsare one of the most important things if you want to get your website or blog ranking in Google search results. Backlinks are like a vote for your website. As search engines can be considered the largest online sources for delivering traffic to web sites, there are hundreds and thousands of online resources, which offer a great number of search engine niche backlinks books, articles, manuals, etc. for the newbies covering hot topic of generating web site traffic and boosting your online income. In this article I would like us to take a closer look at such products, their availability and worth. Amassing all the niche blog comments you want is alright. You may be able to have a million backlinks with some backlink builders. A hundred articles pointing to your website could mean hundreds of backlinks in total. Would that be realistic? Maybe yes... maybe no. In India now a days their is the atmosphere of elections. Political parties are approaching towards public with new campaigns . And all parties are focusing towards people's common problem they are facing daily. Well I am the supporter of BJP . Capture a Video of Santa Claus at your House!